Sally Mauk: Welcome to "Campaign Beat" our weekly political analysis program I'm Sally Mauk and I'm joined by veteran Capitol Reporter Chuck Johnson and University of Montana Political Science Professor Rob Saldin. And Rob, this week The Green Party qualified at the last minute for the ballot and now we have two candidates running for U.S. Senate. Two Green Party candidates running for U.S. Senate, both from Bozeman: Steve Kelley and Tim Adams. But the Adams candidacy seems fishy because he has worked in the recent past for the state Republican Party. What's going on here? Rob Saldin: Yeah exactly. He's not just a Republican but an employee of the state Republican Party. In recent years he's also worked on a number of other conservative causes. So obviously this makes no sense, him running under the Green Party banner, which of course the Green Party is well to the left of the Democratic Party, to say nothing of the GOP. So this has all the hallmarks of a Republican effort to make sure that there's a Green Party candidate on the ballot this fall in the hopes of having some progressives abandon Jon Tester and vote for the Green Party candidate, which would obviously help the Republicans. SM: It does look like there will be a primary to pick the Green Party's nominee, given that there are two candidates in the Senate race, and that person will be on the November ballot. And the coordinator for the Montana Green Party, Danielle Breck, thinks that's all to the good. "The Democratic Party is not entitled to progressive votes simply because they are the mainstream left-wing party," Breck says. SM: And in a close race, Rob, a third party, as you just said, can swing the outcome. And in this case the swing would favor the Republican candidate most likely. RS: Oh absolutely. So basically Breck's point is that — it's an old one in American politics — in this case, the Democratic Party is basically full of a bunch of sellouts and that there's no meaningful difference between the Democratic and the Republican Party so what we need is a real alternative. And of course right-wing people have said the same thing over the years. And there definitely is, I think, Sally, some truth in this. The two party system in the United States, it does push the parties to the center. And it does make it harder for extremists, be it on the far left or on the far right, to gain power. Now of course, other people say, well that's the exact reason why a two party system is so good is because most of the time it has a moderating effect. But you're exactly right, from the perspective of mainstream Democrats, mainstream Republicans, these minor parties can spell disaster. And in fact if you go back to most notably the 2000 presidential election, Ralph Nader took votes away from Al Gore. Al Gore would have won that. He would have been president had it not been for Ralph Nader in the Green Party. It's a little less clear cut in the case of Jill Stein last year taking votes away from Hillary Clinton. But it's possible that Hillary Clinton would have won had it not been for Jill Stein. And six years ago it's possible, on the other side, that the Libertarian took enough votes away from Denny Rehberg in his race against Jon Tester for the U.S. Senate. So these third party candidates, they aren't going to win, but they can throw it one way or the other. SM: Chuck, the incumbent in the race, Democratic Senator Jon Tester has his first TV ad out, and it's hitting a bunch of positive notes. Tester ad: "Washington is a mess, but that's not stopping me from getting bills to help Montana signed into law by President Trump. "One: reducing government waste, fraud and abuse. Two: improve veterans health care. Three: cut red tape at the V.A. Four: expanded our education benefits. Five: did right by our cops firefighters and paramedics. Six: support for our caregivers. Seven: got us the gear we need it. Eight: I'm outta fingers, but I'm not finished getting things done for Montana. I'm Jon Tester and I approve this message." SM: And Chuck, the visual at the end of this ad has Tester holding up the hand that's missing some fingers from a childhood run-in with a meat grinder. So this ad has some humor and a sort of, I can get things done,' positive message. Chuck Johnson: Yes, it's saying I can work with President Trump when I need to. I can get bills passed. I've done things for veterans, law enforcement, firefighters and the like. I think it's good that it says, yeah, things are a mess in Washington, but I can get things done. I think it hits about every chord and sends a good message for Tester that he can get things done. I think it hits on all counts. SM: And like you said, he really does want to emphasize that he can work with the president, that's going to be a key message. CJ: Well, I think so. And we've also talked on the show about how Trump remains pretty popular still in Montana. So I don't think Tester dares attack Trump. No need to. He will need some of those Trump voters to get reelected in the U.S. House race. SM: Rob, a sixth Democrat has entered, Bozeman environmental attorney John Meyer. And environmental issues are the focus of a new ad against the incumbent Republican Greg Gianforte, and this ad is sponsored by the League of Conservation Voters. League of Conservation Voters Ad: "There is a shadow creeping across Montana. Somebody is attacking our way of life and assaulting our public lands and national monuments. It's Washington politician Greg Gianforte. He's attacking our national monuments on public lands, putting D.C. politics ahead of Montana families. If Montanans don't take a stand now our access to public lands and national monuments could disappear forever. Tell Greg Gianforte these aren't Montana values. Stop voting to assault our public lands." SM: Two of the verbs, "attack" and assault" are used four times in this ad, and it's a not so subtle reference to Gianforte's assault of a reporter in his last campaign. RS: Yeah exactly. Ostensibly this is in regard to Gianforte's record on public land issues and probably in particular his legislation to eliminate 29 wilderness study areas. And those bills , it's probably worth noting, those are very extreme in the context of wilderness and public lands policy. If that legislation passed, it would be the biggest blow, I would say, to conservationists since Ronald Reagan vetoed a compromise bill back in 1988 that would have basically resolve this issue over which lands in Montana are going to be wilderness and which aren't. But obviously the other thing going on with this ad is that it's a reminder, just in case anyone needs it, that Gianforte attacked a journalist the night before the special election last spring and was later charged and convicted of assault. 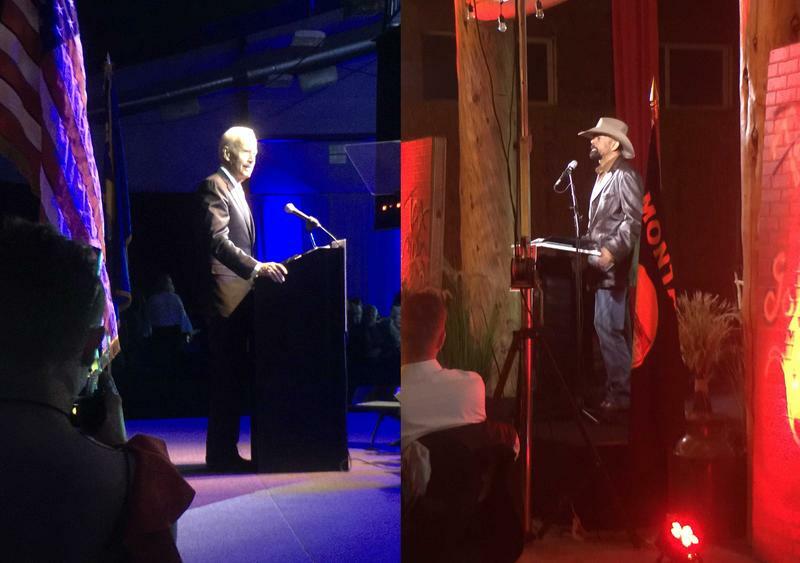 SM: Chuck, three national figures came to Montana last weekend to campaign: former Vice President Joe Biden, Wisconsin Sheriff David Clarke, and political commentator Dinesh D'Souza. And Biden of course is a liberal Democrat and the other two are far right conservatives. The press covered all of these talks except D'Souza. Flathead County Republicans would only allow one local reporter into his talk, barring others, including MTPR's Nikki Ouellet from covering this speech. That's outrageous, Chuck. CJ: I agree Sally. I've covered a lot of Mansfield-Metcalf, Lincoln-Reagan Day dinners, Jefferson-Jackson Day dinners over my life and I've never been denied the opportunity to cover it. Most political parties in Montana encourage you to come. They welcome you. They'll offer you a free meal, and I'll say we can't take the free meal but we'll bring our own or we'll pay for the meal. But, this is unheard of. And I find it appalling. I would hope people would be critical of this. SM: Here's what Kalispell Republican legislator Derek Skees had to say about picking and choosing who could cover the D'Souza talk. "It's simple because the press slants the news so bad to the left that we're almost positive we wouldn't get a good story from the left," Skees said. "So why would we want to encourage that?" SM: So I guess Chuck, he saying that only reporters they perceive as being politically friendly — coming from the right, I suppose — should cover Republican events. CJ: That's a unique view in Montana. Skees has been a critic of the press in the Legislature, and I think he has his feelings. He's a Tea Party legislator who's pretty outspoken. But even so, there's no reason they shouldn't have allowed the other reporters to attend this event. I would think they would want to get that point of view out, you know, the speaker's point of view out to the broader public. SM: Denying the press access is essentially denying the public the right to know, and I think that's a very bad precedent. Rob, Sheriff Clarke, the controversial sheriff David Clarke urged his Montana audience to help keep President Trump from being impeached by going to the polls. "There's a chance that the wall never gets built and that the Obamacare mandate gets restored. Oh yeah and count on President Trump being impeached. Ladies and gentlemen I'm here to implore you. We have to regain our sense of urgency about what we're up against. We have to become angry about the thought of losing this unique opportunity to make America great again," Clark said. SM: We have to become angry is his message. RS: Yeah. Urgency and anger. These are the two words that stick out. I mean it strikes me that both Clark and D'Souza, I mean, these are figures who are on the very fringe of the conservative movement. In the old days these are the types of people who would have been kicked out of the movement by people like William F. Buckley at National Review. The words urgency and anger, this is just not the kind of vocabulary that Ronald Reagan used to use. Even if you go back half a generation in the Montana Republican Party, the leaders of the party back then, people like Mark Racicot, Bob Brown, I can't imagine that people like that would have wanted to be associated with these types of figures. Even within the conservative movement these are extremely controversial people. SM: Nor would they have kept the press out, either. Chuck, Vice-President Joe Biden had dire view of things, but from an absolutely different vantage point. "Some of the things that are coming out of the Oval Office are so demeaning, are so beneath the dignity of Republicans as well as Democrats,"Biden said. SM: It sounds to me like Joe would like to be the one, Chuck, to restore dignity to the office. CJ: Well he's certainly thinking about it, Sally. He's on kind of a speaking tour around the country trying to decide whether to run or not. And I heard his speech, he didn't really give a clue one way or the other but it certainly sounded as though he'd be interested if all things go well for him. His speech was not as much attack as the other two, but he did get some shots in at Trump like the one we just heard. SM: It's going to be an interesting spring as more and more people come here to campaign for candidates and as more candidates get on the air with their ads and we'll be following all that. You've been listening to "Campaign Beat" our weekly political analysis program. I'm Sally Mauk and I've been speaking with veteran Capitol Reporter Chuck Johnson and University of Montana Political Science professor Rob Saldin. Talk to you next week guys. Thanks. "Journalism and the Public Trust" is a well-timed course being taught this spring at the University of Montana by visiting Pollner professor Deborah Potter. Potter has covered the White House and Congress for CBS, and environmental issues and national politics for CNN. She recently sat down in our studio with Sally Mauk, to talk about "fake news" and attacks on journalists and news organizations. Polls show two thirds of Americans don’t trust the media to report the news accurately. Potter says the decline in trust has been underway for a long time.